I am always up for a good tasting Shortbread. 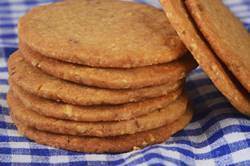 Hazelnut Shortbreads differ slightly from your basic shortbread in that that use brown sugar, instead of white sugar, and unlike the Pecan Shortbreads where the nuts are left in pieces, for these shortbreads the hazelnuts are finely ground. This gives the buttery shortbread a sandy texture and a nutty flavor. For these Hazelnut Shortbreads we are not making individual cookies. Instead, the prepared dough is pressed into two tart pans and the tops are scored lightly so we can cut the baked shortbread rounds into wedge-shaped pieces that can be dipped in melted dark chocolate. Wedge-shaped shortbreads are also known as "petticoat tails" because the shape of the wedges are similar in shape to the bell-hoop petticoats worn by court ladies in the 12th century. And don't worry if the tips of the shortbreads break off. You are not alone. Dorothy Hartley once said (quoted from the Oxford Companion to Food by Alan Davidson) "Every cook knows how the pointed ends of cut cakes and biscuits break off - so, after several centuries of broken tips, someone evolved the cure: they cut a circle out of the centre before baking......"
For this recipe we start with raw hazelnuts. Now, inside the shell of a hazelnut is a rich and buttery nut that is encased in a dark brown skin. Because this skin is quite bitter tasting it needs to be removed before the nuts can be used for baking. This is done by baking the nuts in a moderate oven until they are brown and fragrant and the skins start to peel away from the nuts. Once the toasted hazelnuts are removed from the oven they need to be wrapped in a clean dish towel and allowed to steam for a few minutes. This 'steaming' softens the skins of the hazelnuts so they will easily slip away from the nut. Once the hazelnuts have been left to cool they are now ready for your recipe. To read more on Shortbread Cookies. Hazelnut Shortbreads: Preheat oven to 350 degrees F (180 degrees C). Place rack in center of oven. Lightly butter (or spray with a nonstick vegetable spray) two - 8 or 9 -inch (20 or 23 cm) tart pans with removable bottoms. 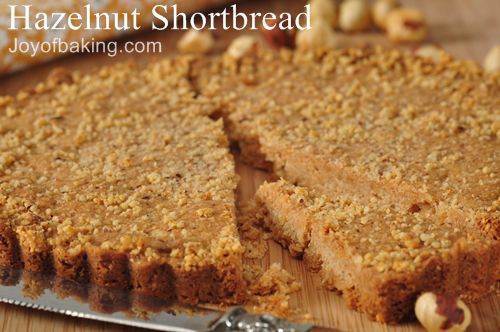 Place hazelnuts on a baking sheet and bake for approximately 15 minutes or until brown and fragrant and the skins start to peel. Remove from oven, place the warm hazelnuts in a clean dish towel, roll it up, and let the nuts steam for 5 minutes. Briskly rub the nuts to remove most of their skins. Set aside to let the nuts cool. Place the hazelnuts and 2 tablespoons (30 grams) of the brown sugar in a food processor and pulse until the nuts are finely chopped. In a small bowl combine the flour, cornstarch (rice flour) and salt. In bowl of electric mixer, or with a hand mixer, beat and butter and remaining brown sugar until smooth. Add the vanilla extract and beat until combined. Add the flour mixture and beat until incorporated. Stir in the nut mixture. Divide the dough in half. Press each half evenly into the prepared tart pan. Using a sharp knife, score (make shallow lines) each shortbread into 16 even pieces. Place in preheated oven and bake until deep golden brown, about 25 to 30 minutes. Transfer shortbread to a wire rack and cool for five minutes before removing from tart pan. Place the shortbread round on a cutting board and cut each shortbread round into 16 wedges (along the lines scored). Cool completely on a wire rack. While the shortbread cools make the chocolate glaze. In a stainless steel bowl, placed over a saucepan of simmering water, melt the chocolate and shortening. Stir until chocolate is smooth and completely melted. Remove from heat. Either dip each wedge of shortbread into the chocolate or alternatively put the chocolate in a pastry bag fitted with a small tip or a paper cone and pipe chocolate in a decorative pattern. Let stand until chocolate sets. Store in airtight container at room temperature up to 1 week. NOTE: You can use two cake pans instead of tart pans, butter and flour pans well. To remove shortbread from pans after having baked and cooled for 5 minutes, take a plate slightly smaller than the pan, place the plate of the surface of the shortbread, and invert the shortbread carefully on it. Reinvert the shortbread onto a cutting board and cut into 16 wedges (along score lines). Cool on wire rack.